"Poor Behavior" –it’s very good! Marriage can be a very fragile alliance. 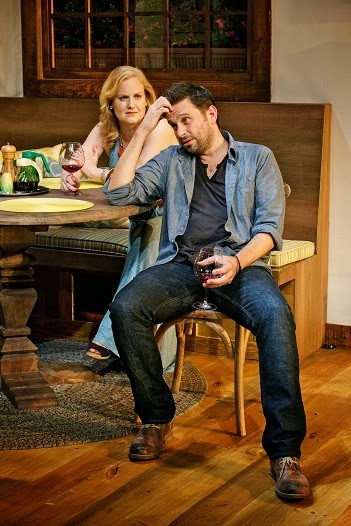 In “Poor Behavior,” at Primary Stages at The Duke through Sept 7th, Theresa Rebeck explores/exposes two couples at the most tenuous point in their clearly wobbly relationships. Ian (Brian Avers) and Maureen (Heidi Armbruster) are spending an ill-advised country weekend with their friends, Peter (Jeff Biehl) and Ella (Katie Kreisler). The first evening begins with a drunken argument between Ella and Ian over morality. His Irish sensibility is aroused by even the suggestion that things can be deemed good or bad, but it is evident that only he and Ella relish the fight. As their respective spouses head off to bed, Ian and Ella share an innocent tender moment, caught by the ever-hysterical Maureen. The actors, guided by Evan Cabnet’s excellent direction, are wonderful. 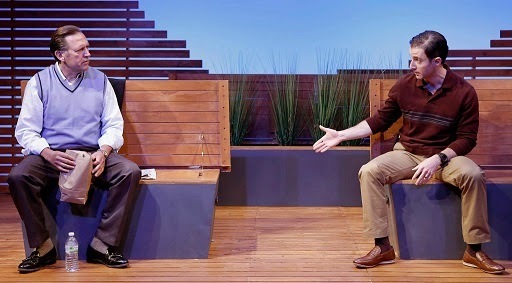 The play, a brilliant work in the Rebeck oeuvre, is at once funny and distressing. Watching things devolve is agonizing and delightful. The dialogue in “Poor Behavior” is sharp, quick and witty. Lauren Halpern has designed an admirable country house, just cramped and uncomfortable enough to echo the proceedings of the script. “Poor Behavior” is an entirely satisfying experience. 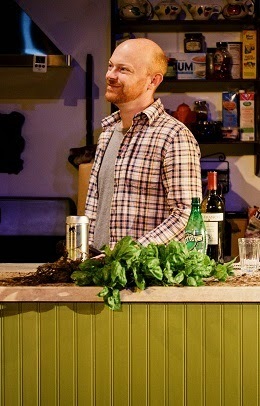 To learn more about Theresa Rebeck’s “Poor Behavior” and Primary Stages, visit www.PrimaryStages.org. Often it seems that defying gravity is how we define dance. Hold your breath as dancers twirl in impossible contortions before you. Catch your breath as they move gracefully and effortlessly through air and space, sometimes telling a story, sometimes just rejoicing in movement. Annmaria Mazzini, a former Paul Taylor Dance Company dancer, and Artistic Director of The Mazzini Dance Collective rejoices in dancemmaking as story telling. 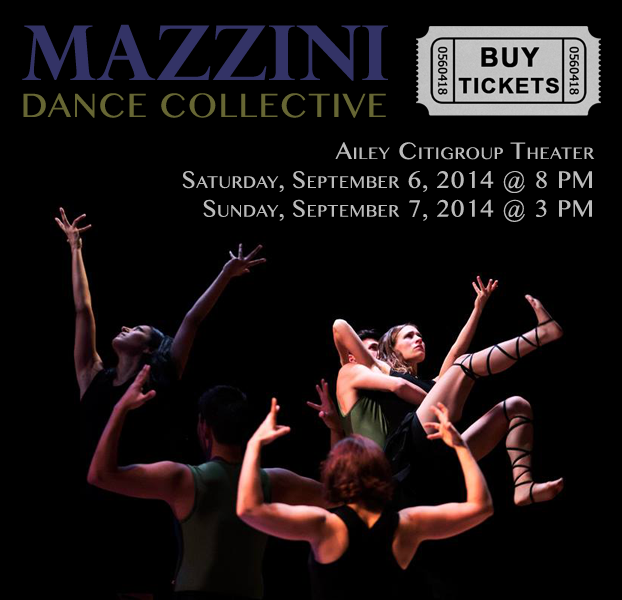 The Mazzini Dance Collective (MDC) holds its two-day only debut New York season on September 6th and 7th at The Ailey Citigroup Theater in The Joan Weill Center for Dance. MDC was formed to be a collaborative between artists across visual and performing arts media. MDC is an inter- disciplinary, multi-generational troupe, integrating the arts of film, music and design. At MDC, young dancers are inspired by veterans to reach new levels of excellence in technique, performance and choreography. On the bill in this inaugural season are the work of MDC Composer-in-Residence Robert Paterson, members of the American Modern Ensemble, Orion Duckstein, and Francisco Graciano, appearing courtesy of the Paul Taylor Dance Company. Several premieres will be presented during the two days of programming. They include “Playing with Angels,” a reflection on the relationship between mothers and sons, choreographed by Annmaria Mazzini with music by Robert Paterson, with the score performed live by members of American Modern Ensemble: Billy Hestand on bassoon, Billy Short on bassoon, and Bryan Wagorn on piano. “When We Rise” is a premiere of a piece choreographed by longtime MDC collaborator Orion Duckstein with music by Zoe Keating and performed by Mr. Duckstein and Annmaria Mazzini. Another new Mazzini creation, “Criminal Commoners,” set to music by the Yeah Yeah Yeahs, St. Vincent, Phantogram, Cold War Kids, Pulp, and Goldfrapp, and an original piece by Damian Eckstein, features guest artist Francisco Graciano. in a photo by Carol Rosegg. If brevity is the soul of wit, the short short play should prove the embodiment of that spirit. 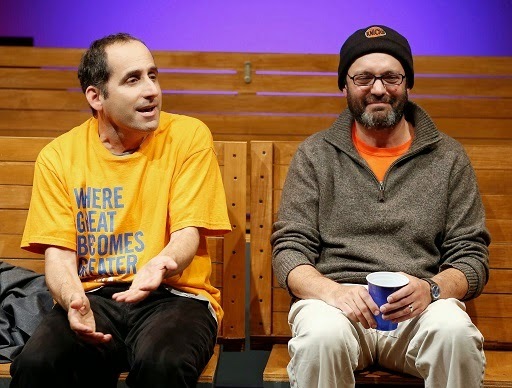 Some do so with heart, some with humor, but all three of the “Summer Shorts: Series A,” at 59E59 Theaters through August 30th, are entertaining and interesting. Each in its own unique way. The most pleasing of the lot is “Sec. 310, Row D, Seats 5 and 6,” Warren Leight’s ode to men and sportsfans. Three season ticket holders in Madison Square Garden nosebleed seats share the agonies of being Knick fans as their lives unfold over some twenty years. It’s a funny and well-played little drama. Geoffrey Cantor, Peter Jacobson, and Cezar Williams give nicely tuned performances under Fred Berner’s direction. Roger Hedden at “Summer Shorts Series A.” Photo by Carol Rosegg. Did spirtuality or too much weed drive George (Shane Patrick Kearns) to jump off a cliff? This mesa was where he wanted to celebrate his marriage. Aldie (Alex Breaux) lives with the regret of cracking wise when he should have been attentive to his friend. Allison Daugherty rounds out the cast in Roger Hedden’s “The Sky and the Limit.” Under Billy Hopkins’ direction, this simple story simply told has depth and humanity. 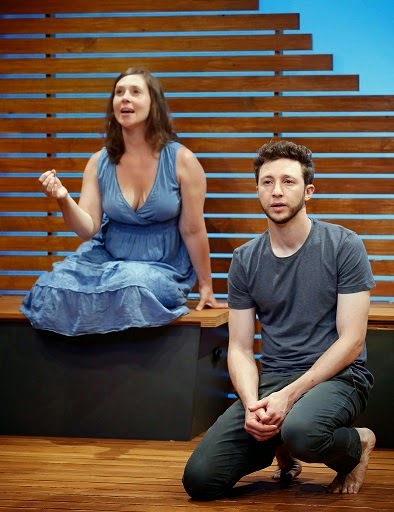 Filling the spaces of loss with a calm that belies their emotions, Adam (Adam Green) and Megan (Miriam Silverman) take turns retelling the story of the death of their daughter Lucy. Eric Lane’s “Riverbed” is about the consequences of one moment of inattention. Megan and Adam are nice people struggling to reconnect after their younger child drowns. It’s the unexpected in their story that makes this monologue come powerfully together. For more information about “Summer Shorts,” please visit www.59e59.org. There are many iterations of the short story. Probably that look your mama gave you is the shortest. The tales Lydia Davis tells are almost haiku like. For most playwrights, the short form is aka the one-act. 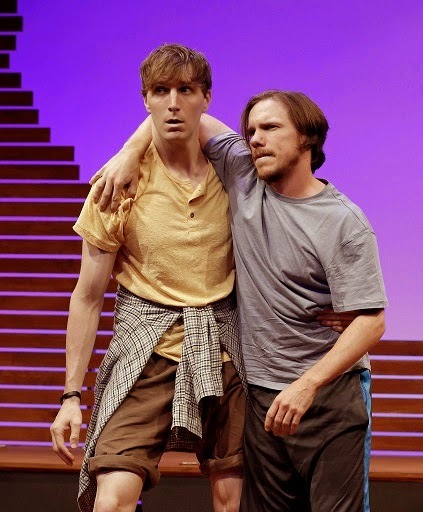 Traditionally, “Summer Shorts,” a Throughline Artists production in repertory at 59E59 Theaters through August 30th, have upped the ante on short by curtailing the action to a mere fifteen or 20 minutes. Developing a storyline from top to bottom in that time is a challenge. This year’s offerings are a bit longer, running into regular one-act territory. Some of these succeed better than others. With every chatty line of dialog, Neil LaBute builds tension, so that you wonder where his story is going and how or if it will resolve. What seems casual is deliberate and taut. The poignancy in Daniel Rietz’ “Napoleon in Exile” burns beneath genuine humor. Henny Russell and Will Dagger are natural and charming as mother and son. Albert Innaurato disappoints with a ranting sketch comedy– of excessive length at 40 minutes–that aims to offend. Innaurato’s liner notes on the trajectory of his career are the best part of his contribution. The piece, entitled “Doubtless,” no doubt as a not so subtle pun on John Patrick Shanley’s “Doubt,” gets a little help from Jack Hofsiss’ lively direction and a fearless cast. For more information on “Summer Shorts 2014,” visit www.59e59.org or http://summershortsfestival.com/. To be young and in love against the wishes of family and friends is a timeless and eminently romantic tale. Long before William Shakespeare turned Juliet and Romeo into household names, stories of the star-crossed pair were lore. In celebration of Shakespeare’s 450th birthday and for its 25th anniversary, Dances Patrelle (dP) performs “Romeo & Juliet,” featuring Francis Patrelle’s choreography, based on Shakespeare’s play and Prokofiev’s score. Each year, dP presents two seasons in New York City– the holiday production of FP’s “The Yorkville Nutcracker,” and a spring repertory season featuring world premieres and favorites from FP’s body of danceworks. For this year’s offering, dP will be at Hunter College’s Kaye Playhouse from September 11-14. The roles of Romeo and Juliet will be played by Alexander Castillo, a Bayside, NY native, who at 13 performed in Patrelle’s “The Yorkville Nutcracker,” now dancing on the West Coast, and Chloé Sherman, also originally a New Yorker featured in the “The Yorkville Nutcracker,” as a student, who is now in the Los Angeles Ballet company. FP has wrought a wide range of styles in his repertory, from the strictly classical to the contemporary with stops at the American Songbook along the way, always finding the drama in the dance. His “Romeo & Juliet” celebrates the soulful tragedy in the best classicist form. In 2013, dP was named the resident ballet company of the Kaatsbaan International Dance Center in Tivoli, NY.